The South Eastern Railway, long time rival of the LC&DR in Kent, was the first of the two companies to arrive in London – in 1836 it shared the London Bridge terminus with the London & Croydon and London & Greenwich companies. The SER added three further London termini to it’s bow; Bricklayers Arms in 1844, Charring Cross in 1864 and Cannon Street in 1866, however it had no direct access to the Widened Lines until 1878 when the link between Metropolitan Junction and St. Pauls (Blackfriars) was opened on the London Bridge – Waterloo line. The SER was less active in cross-river services than its rival the LC&DR, but nevertheless, within a month the company was providing trains to Enfield and Ally Pally on the Great Northern. The company’s first locomotives to be fitted with condensing apparatus were Cudworth’s 235 Class of 0-4-4 Well Tanks of 1866, slightly odd looking locos with very long bunkers, but the locos were painfully under-powered for Widened Lines duties, struggling on on the steep gradient connecting line at Metropolitan Junction. 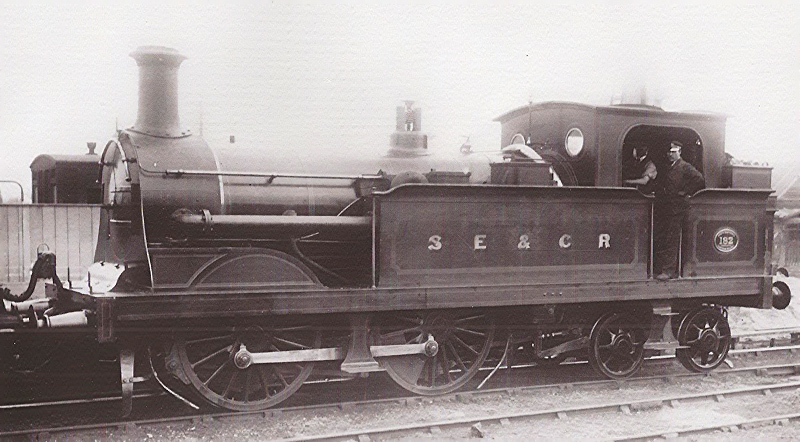 Until the situation could be remedied, the current Locomotive Superintendent, James Stirling (brother of Patrick) approached and bought three of the well-proven Beyer Peacock 4-4-0Ts from the Metropolitan Railway which were used exclusively on cross-London services to GNR destinations until Stirling’s own design could be implemented (more of which anon) in 1881. Meanwhile, from the 1st April 1880, the SER began running sixteen trains daily from Addiscombe (Croydon) via New Cross and the East London Railway (ELR), under the Thames to Liverpool Street. In 1882, the SER became one of the co-lessees of the ELR, and from 3rd March 1884 the company cut back the service from Addiscombe – St. Mary’s, until withdrawing it completely on 30th September of that year. In 1865, despite not providing any passenger services over the ELR, the SER took over responsibility for maintaining the line. With the opening of the New Thames Tunnel in the early 90s, the SER took the opportunity to provide a circle within the Circle service out from New Cross and back again via Deptford Road on the ELR, the New Thames Tunnel, Limehouse and Basilica Fields on the Extended Widened Lines, Bishopsgate and St. Pauls on the Widened Lines, and finally round to London Bridge and back to New Cross. The photo is one of Cudworth’s 235 class, no.241, and Stirling’s domeless boilers were fitted during 1881-3. It was the first front-coupled bogie tank design built for an English railway, and both the driving wheels and bogie axles were connected by compensating beams. Four of the class (but not no.241) were fitted with condensing apparatus in June 1878 for services running between Woolwich Arsenal via Metropolitan Junction and the Widened Lines to Enfield, Muswell Hill and Alexandra Palace on the GNR. The Beyer Peacock 4-4-0Ts relieved them of these duties in 1880, and the class were instead transferred to East London Railway duties. 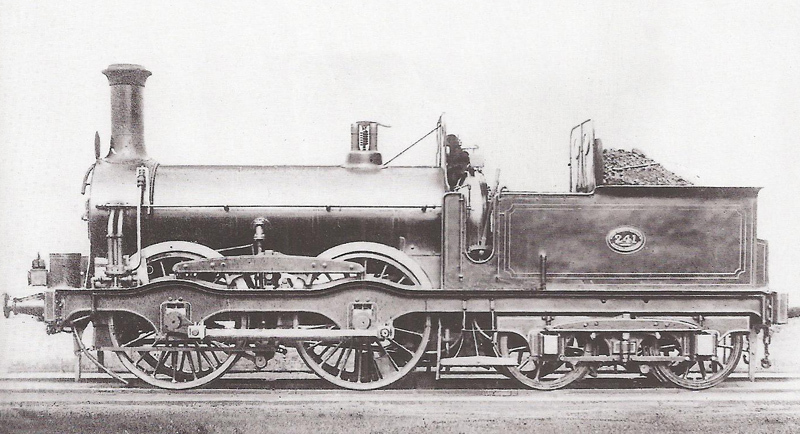 These locos were then relieved from that line when Stirling’s Q class were released to traffic in 1882. This class won’t be represented on Basilica Fields; all bar two were gone by 1890, one of which went that year, and the other lingered at Ashford Works until 1893. However, they are an interesting locomotive to highlight, not least in terms of historical importance, and must have looked extraordinarily quaint, even during their last years of service.